This blog will be issued every Monday, Wednesday, and Saturday morning and updated if the weather is changing or critical or interesting weather events are occurring. A weak frontal system is brushing the north end of the state today. This system will bring clouds and a few light showers to the north coast, Trinity, Siskiyou, Shasta, Lassen, and Modoc counties. Snow levels will be 2500 to 3000 feet. The rest of the north state will be partly sunny. 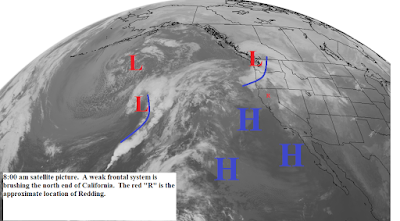 High pressure is slowly building along the west coast. This will push the jetstream northward. Sunday through Tuesday will be partly sunny to partly cloudy with light winds. Tuesday there could be a few showers over the northwest corner of the state from a storm moving by to our north. 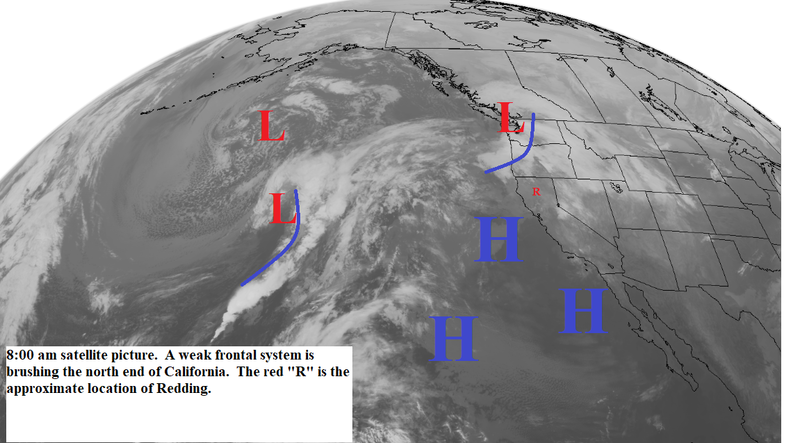 Wednesday through next weekend a strong high pressure ridge will be along the west coast (see map below). This will bring mostly clear skies to our area with above normal daytime temperatures. Winds will be light.